As I began to read for this week’s assignment, a book I had ordered arrived from Amazon. It’s the third edition of John Trimble‘s Writing with Style. If you haven’t used this book, it’s a great one. I had the first version on my bookshelf from 12th-grade English, and when I went to look at it recently, began to wonder about it. A Google search turned up a third edition, and a strong recommendation. 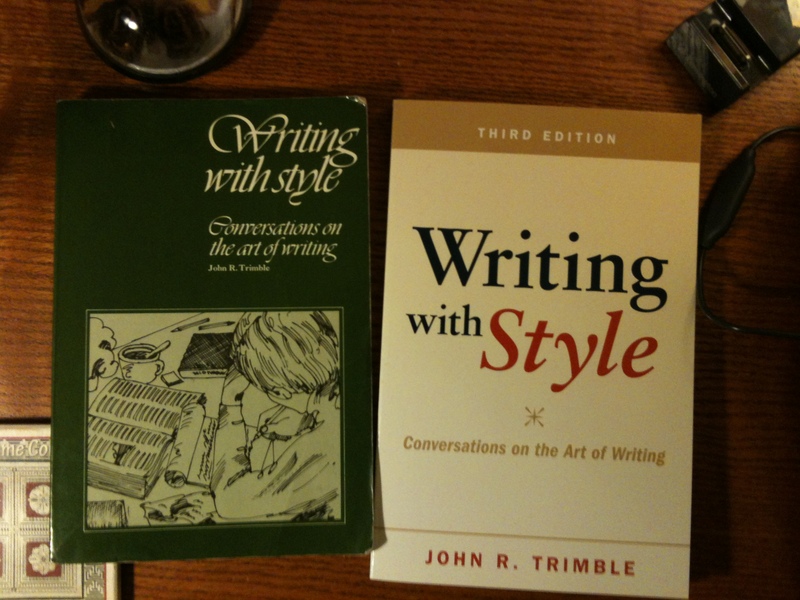 First and third editions of Writing with Style. Notice the differences. Where is your eye immediately dreawn? When the book arrived, the first thing I noticed was, of course, the cover–particularly the difference between the covers of the first and third editions. The font difference, especially, was telling. 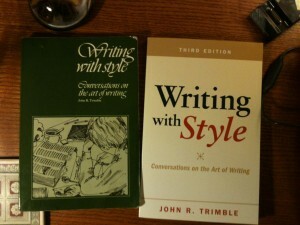 As you can see, the first edition–published in 1975 (and showing a much younger Trimble on the back) uses a calligraphic font, while the third edition uses a serif for the book’s title, and a sans-serif for the subtitle, author, and edition. 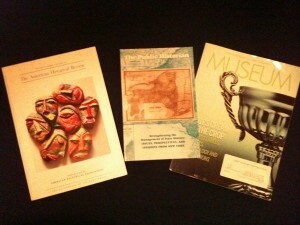 What particularly struck me, though, was the message that the typefaces sent. Whereas the first edition used the same font face, size, and color for the entire title, the third edition uses changes in color, style, and size to make its point. The word “with” is diminished. Meanwhile, the viewer’s eye is immediately drawn to the word “style.” Not only will this book teach you how to write. Most importantly, it will teach you how to write with style. I use this example to illustrate the major point of this week’s readings: type, as a component of design (whose general importance was the subject of last week’s post), matters. Like with design, we as historians must think more about the messages that our fonts convey. This is prevalent in the exhibition world already–would you feel a sense of dissonance from, for example, a Civil War exhibition that uses Helvetica? Just the same, for web work we also need to consider our font, and be willing to play with styles and sizes. I personally loved the book Thinking with Type, as it helped me, well, think with type; I already noticed its impact on Friday, when I designed a flyer for an upcoming work event. The book presents typographic rules in easy-to-understand terms, and also, as Megan notes, gives some personality to the myriad (the word, not the font) fonts that appear on one’s computer. Downed tree in front of offending GAO sign, February 2010. 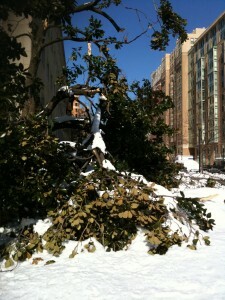 I'm guessing Ellen Lupton would have liked to see the tree take the sign down with it. As a side note: I couldn’t help but laugh that Thinking with Type cites the sign of the Government Accountability Office, across the street from my office, as committing a “crime of type.” When doing research for the walking tours I lead around that neighborhood, I came across a building that once occupied the block where that criminal sign now sits: the Typographical Temple, home to the Columbia Typographical Union. Appropriate.